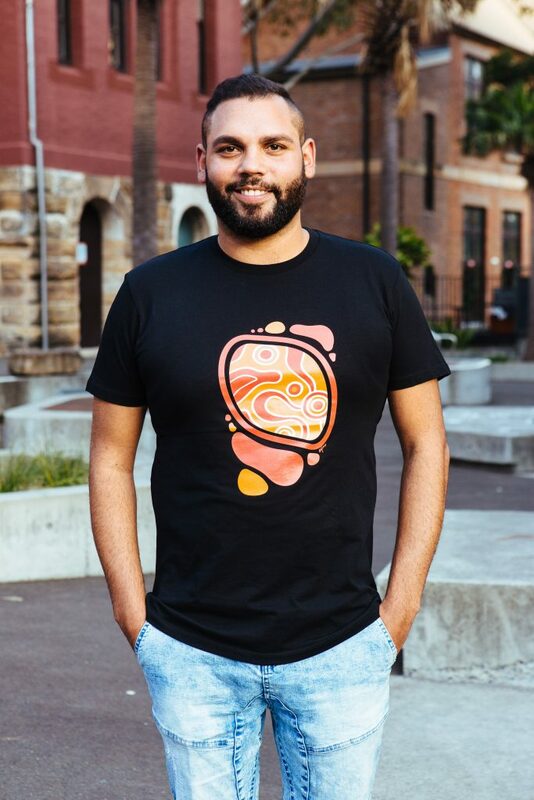 The amazing artist Dennis Golding has produced a beautiful t-shirt for us here at the NCIE. This is the first time we’ve collaborated with an artist for a t-shirt and we’re so proud to be working with Dennis! 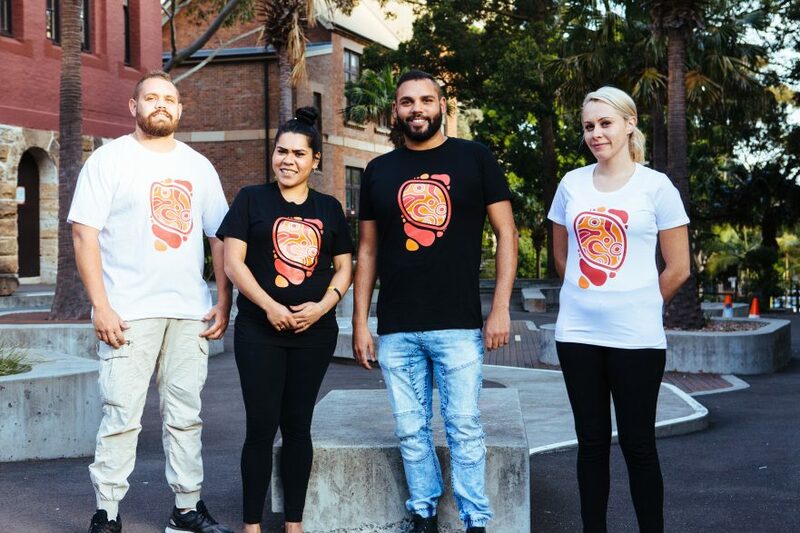 The artwork on the shirt, Working Together – being worn in this photo by Dennis along with April Roberts, Malcolm Roberts and Chloe Cowan from NCIE, encompasses the values and aims of Indigenous Excellence in sports, health and wellbeing. The other circles depict other local Indigenous communities that are strongly connected to the NCIE which include Redfern, Waterloo, Glebe and La Perouse. This beautiful shirt is on sale at the NCIE Fitness cafe for $40.00. It comes in black and white and in men and women’s styles…. but hurry, it’s moving fast! Dennis Golding is a descendant of the Gomeroi/Gamilaraay people from the North West of New South Wales. Born in Sydney, he spent most of his childhood in Redfern, and still lives and works in Sydney. He continues to develop his artistic practice through studying a Bachelor of Fine Arts (Honours) at UNSW, working with local community organisations, and with his professional experiences. These include, working as an Assistant Curator, and as a First Nations Creative Producer at the Australian Design Centre. He is also well known as a designer of special event football jerseys with Qantas Wallabies, Wests Tigers and South Sydney Rabbitohs among his clients. Dennis worked with the children in NCIE’s After School and School Holiday programs to produce this huge artwork called Walking Together that hung in the athletes village in Rio during the 2016 Olympic Games.